Sometimes you just have to listen to your cravings. You know, those ones where you just throw things together and you're not that sure if it'll work but it satisfies your craving all the same. Well, this is on of them. And, in my opinion, it TOTALLY worked. 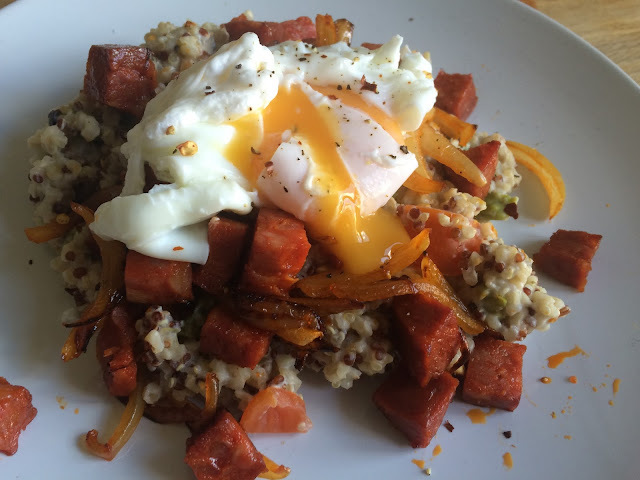 Quinoa, poached eggs and chorizo are probably three of my top 5 foods. They're so versatile and well, I would eat them every single day if I could. I tend to buy my chorizo from the deli counter and kind of in bulk really, so I just chop off a rough amount per recipe - so you may want to make your own judgement with how much to use. Chorizo, cubed - I usually go for around 8cm in length and chop into cubes - if that helps you make a judgement on how much to use? 1. Bring your quinoa and water to the boil in a small saucepan - I usually cook mine for around 15-20 minutes until it is soft. If you need to add more water, do so, as you don't want it to catch on the pan. 2. Whilst your quinoa is cooking, prepare your other ingredients. Chop your chorizo, slice your onion. 3. When your quinoa has about 10 minutes to go - grab a frying pan and fry your onion and chorizo on a low heat. You don't need to add oil as the chorizo will release the oil needed to cook your onions. 4. For your egg, my top tip is to use a shallow frying pan to poach rather than a saucepan. I find it much easier and I feel like you're less likely to overcook the egg. I like a reeeeally runny egg so mine only ever see the pan for 3 or 4 minutes. Bring some water in the pan to the boil, add your egg and poach on a low heat. 5. 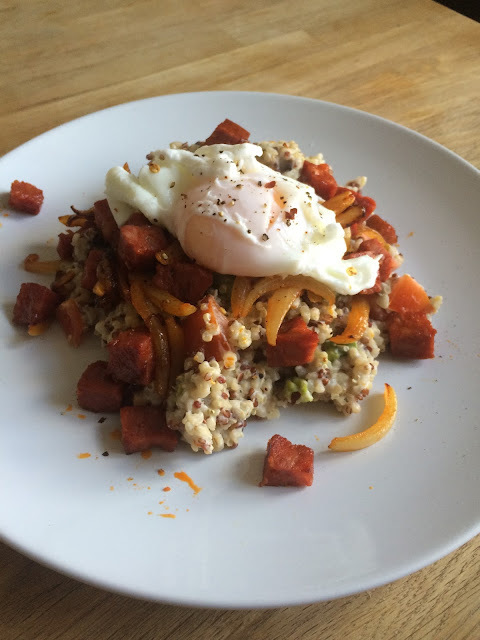 While the egg is poaching, quickly plate up your quinoa and half of your onion and chorizo mix. 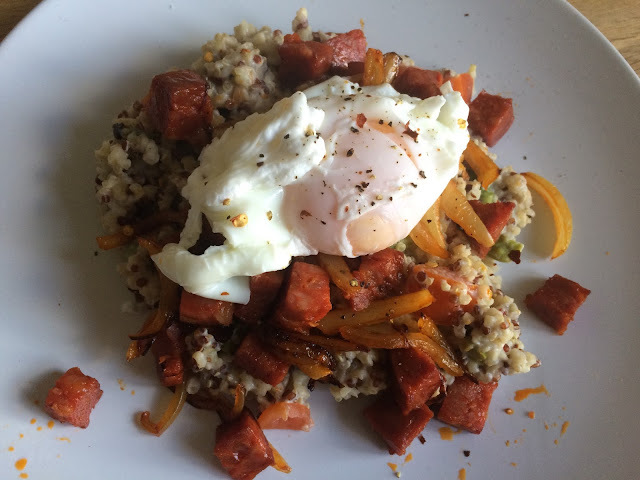 When the egg is done, place it on top of the quinoa and chorizo/onion mix. Scatter the rest of the chorizo/onion mix around the egg. Add your seasoning. SUCH a simple but satisfying dish. What are your weird culinary concoctions that just work? This looks delicious! I still haven't tried quinoa (I know, I'm a bad blogger) but I think this might be enough to push me to finally do it!